Scoring questions, often called matrix questions, allow your participant to assign a numerical score to a series of choices. Type each choice and decide what the maximum score is. The default setting is a score from 1 to 5. You can set a maximum score of between 2 and 10. The maximum distance between your minimum and maximum scores can be 10. Scoring Questions only require a single row to be answered. If you create a question with multiple rows, your participants may answer the first row and move on to the next question. If you require an answer for all your labels click the Require Score for All Rows checkbox. To set a minimum score either click in the Minimum Score input field and type in the number or use the Up and Down Arrows that appear on the right side of the box when you hover over it. If you click Define Score Labels you can label your minimum and maximum scores. This is helpful for letting the survey participant know what the range means. Click in the Minimum Label box and type in the label for it. To set a maximum score either click in the Maximum Score input field and type in the number or use the Up and Down Arrows that appear on the right side of the box when you hover over it. If you click Define Score Labels you can label your minimum and maximum scores. This is helpful for letting the survey participant know what the range means. Click in the Maximum Label input field and type in the label for it. To add a new row label, click in the New Choice input field beneath Labels. Type in the desired label. A new label box will appear. You can continue to enter in all the needed labels. To remove a label hover over the label you want to delete until you see the gray X appear in the right side of the Choice box. Click the X to delete that choice. To reorder a label hover over the choice you want to move until you see the gray Move icon appear in the right side of the Choice box. Click and hold the arrow and drag the label to the location you want. By default, a survey participant can give all the labels the same score. If you want to require that each label has a different score, click the Unique Score for Each Row checkbox. This is often used when you want the survey participant to rank the list. 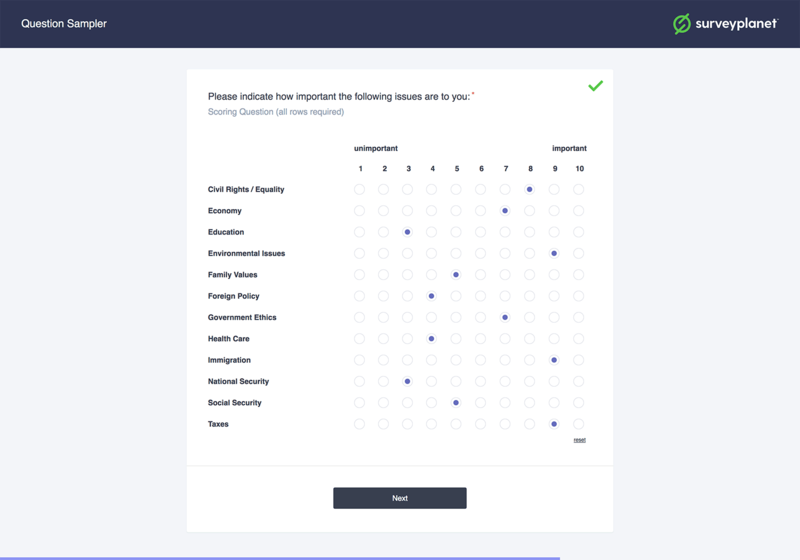 With a scoring type question the survey participant can score just a single row and then move on unless you select the Require Score for All Rows checkbox. The question is marked as required. One of the other rows has been answered.